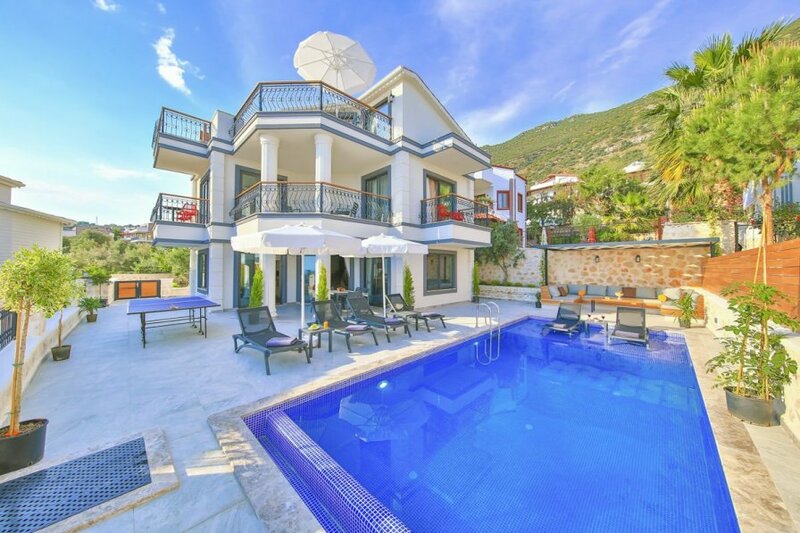 Three-bedroomed Villa Eda in charming Kalkan, on the Turkish Mediterranean coast, has everything you need for complete relaxation. Three-bedroomed Villa Eda in charming Kalkan, on the Turkish Mediterranean coast, has everything you need for complete relaxation. It's sitting pretty on the tree-lined hillside with magnificent views of the bay. Take a cooling dip in your private swimming pool or dine al fresco on your spacious sun terrace; with access to another large pool, top-notch restaurant and bar at the nearby hotel there's almost no need to leave, but the town centre with bougainvillaea-draped houses awaits you below. For a comfortable home-from-home stay, there's also an open-plan kitchen and living area, well-equipped with everything you might need for eating in. The cushioned sofas are perfect for spending some quality family time indoors, as is the table tennis outside. All the bedrooms at Villa Bir are all equally stylish and spacious, with two rooms on the ground floor and one on the second. Each bedroom has a balcony for soaking up the fantastic setting, as well as an en-suite and flat-screen TV. Villa Eda is in the Kiziltas, a beautiful area of Kalkan on Turkey's coast. This friendly and laid-back harbour-side town boasts the majestic pin tree-lined Taurus Mountains as a backdrop and has a grand sweeping Mediterranean bay. It's a fantastic base to visit the Lycian ruins from or engage in the many local activities. Apart from the main pebble beach near the marina, where you can swim in the sheltered waters or relax on the soft sandy shores, there are many beach clubs set into the rocks, offering restaurant and bar service to your sunbed.